You must know the famous TV show, The Great British Bake Off! Enjoy a similar experience on Baking Bonanza at Vegas Spins. It is an instant-win game second to none crafted by Gaming Realms. You are presented with a simple and fun-filled game which involves delicious cakes, like Rocky Road, Cherry Pie, Blueberry Pie, Double Chocolate Cake and Peanut Butter Cookies. During your gameplay, you can also come across several ingredients, such as Cream, Flour, Sugar, Walnut, Pineapple or Butter amongst others. Here, your goal is to collect the correct ingredients to complete the cake recipes displayed on the screen. Play this superb game at Vegas Spins using any kind of device! Can’t wait to try Baking Bonanza? Set the ball rolling by selecting a stake value of your choice with the Up and Down arrows on the Stake display. Your stake amount represents the price for 5 spins. Clicking on the Spin tab launches the game. The single slot reel found at the bottom of the screen spins to reveal various ingredients. These are cumulated over 5 spins on the screen, beside the corresponding cakes. When all of the 5 spins are played through, you can buy extra spins to complete the remaining recipes. Also, find the corresponding prizes next to each cake. Ready for a taste of these delicious goodies? Bet Levels: No bet levels are found on Baking Bonanza. Amount of Paylines Selection: There are no win lines as it is an instant-win game. Coin Values: The stake amounts vary from £0.01 to £1.00. Not enough spins to complete your recipes? Baking Bonanza offers the chance to purchase additional spins! 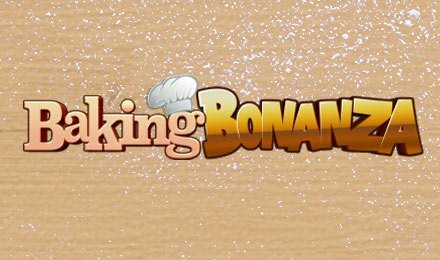 If you are searching for better payouts, don’t miss the Free Spins Mode on Baking Bonanza! When the Free Spins are already played, you can also buy extra free spins. On Baking Bonanza, the different ingredients are all collected across 5 linked spins. Guess what! You can choose the pays and volatility for each round on Baking Bonanza. Load Baking Bonanza at Vegas Spins and be ready for hours of entertainment and fun. Wish you good luck!